323 Kusweg Tergniet Mossel Bay - Tergniet Accommodation. 323 Kusweg is a cosy beach front holiday home situated in the quiet town Tergniet, near Mossel Bay. The perfect location for you and your family to relax and unwind. This self-catering accommodation is situated in the South Coast of South Africa, halfway between Cape Town and Port Elizabeth. Tergniet is about 16 km from Mossel Bay and 13 km from Hartenbos. The closest airport to Tergniet is at George - a distance of about 30 km. The beach is just 50m from the house. You can sit on the patio while watching dolphins and whales swim by. The steps going down to the beach is right in front of the house. This self-catering unit near Mossel Bay is a neat and fully equipped holiday home. It offers three bedrooms, two bathrooms and an open plan kitchen, two braai areas and a full DSTV. There is no Wi-Fi facility. MTN data works the best at the house. The house accommodates 6 people. 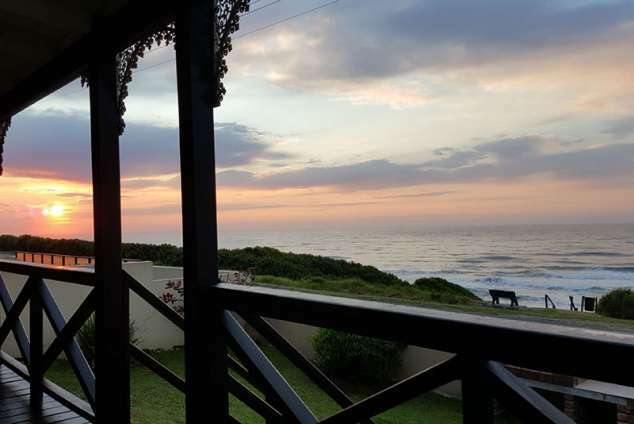 This holiday accommodation in Kusweg Tergniet Mossel Bay offers magnificent panoramic views of the ocean. You can watch the most spectacular sunsets while enjoying a glass of your favourite wine on the patio. This house is pet-friendly by prior arrangement. Only small breed dogs are allowed. We only allow a maximum of two small dogs at a time, during your stay. There are many activities to enjoy. Go for a round of golf at the top courses in South Africa. Hiking, Skydiving, Fishing and Cycling are some popular activities to take part of. Take the kids to Redberry Farm or the Cango Caves, or for a fun day of put-put and trampolines at the nearby Hartenbos. There are many top class restaurants in the area. Book at 323 Kusweg Tergniet Mossel Bay for a fantastic holiday. Detail description : Beach Front Spectacular Sea Views Sea Front Accommodation near Mossel Bay. Watch the dolphins and whales from the patio. 500m from Tidal pool for children (walking distance) Many shopping malls and restaurants within 20km from house. Outdoor Activities: Shark cage diving, whale watching, boat trips, visit Seal Island, fishing, wine farms, beer and whisky tour. Sporting Activities: Golf, tennis, cycling, walking and 4 x 4 routes Visit the historic Cango Caves - about 85km from the house. 7315 page views since 02 Aug, 2017.